Marketing your existing or new Aging Life or GCM business is vital to growth, but where you spend your marketing dollars? What marketing tactics make the most sense for you? Where will you reach your client base best? This is where your marketing strategy comes into play. Before the business can start generating revenue, a marketing strategy and sales techniques must be in place. This new service offers expert professional assistance with the tough choices aging family members must make about elder housing, medical care, personal care, finances, end of life and the myriad mind boggling decisions they face. You marketing message gives this information to the client and the whole aging family in the support system and can transform the family and insure you gain clinets. Adding Aging Life or Geriatric care management to your agency demands top notch targeted marketing.Reaching the elderly themselves, their trusted advisers, and their families takes a combination of education, careful design of marketing materials, a targeted database of potential referral sources, consistent and pertinent communication over a variety of Internet-based communication channels, and lots of positive public relations. Inherent to business success is that the Aging Life or Geriatric Care Managers are educated, experienced, and truly provides a new value-added concierge service to your clients and their families and loved ones. Do You Need Strategic Marketing to Add Geriatric Care Management? Marketing your new aging life or geriatric care management service means targeting potential clients with the ability to pay for aging life care management services. That target is a very small segment of the general population. Furthermore, they must have a need that family, friends, physicians, and trusted advisors are not meeting. More and more, the value of an Geriatric Care Management is being seen by managed care organizations and by those seeking to bundle payment of services in a post-acute care setting. So, where there was traditionally only one target for services, the Geriatric Care Management now has the opportunity to become a part of a group that is managing, providing or overseeing care on a capitated basis for a group or as a service bundled together with other healthcare related services. Although the concept of strategic marketing may initially seem complex for the average Non Profit or PDHC an understanding of integrated marketing communications is an important component of building a thriving practice. Taking the time and resources to understand basic marketing strategy and to develop and implement an integrated, strategic marketing plan helps the new added Geriatric Care Management Product to increase visibility, credibility, and knowledge of services. Where will you locate your Aging life or geriatric care business? You need a plan. This needs to be in your business plan under, Operations section. This section of the plan discusses the place where the company will do business. Whether you are a start up or adding a GCM arm to a non-profit or private duty home care agency you need a business plan or revised one to add aging life or geriatric care management. 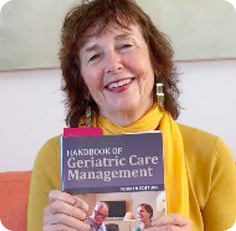 Most beginning geriatric care management businesses start in the GCM’s home office. It is less expensive for a start up. This is sort of like a new band’s garage or high tech start up located inside instead out there with the tools. Some GCMs prefer to rent an outside space. You need to make that decision. If finances are a critical factor, which they are with a start up, you should choose a home office. You need about 600 to 800 square feet and create or use a home office in your home. Location is not a factor in getting customers. Aging Life or Geriatric care management businesses are not like clothing stores or other merchandise-based businesses, which need to be located in areas with considerable foot traffic (e.g., malls, busy streets). Locating the GCM in your own building if you are adding it to your business is fine but it needs it’s own individual space, equipment and staff and should never be located within another division. Care Manager Travel time is a key to location. We will cover that in our next blog. A senior non – profit adding for profit geriatric care management can really benefit from internal referrals. Your non- profit may have a hospice, senior housing, VA program, assisted living, a nursing home or a retirement community that could refer middle or upper income seniors to your care management program. But those programs and professional need a buy in before they will make those referrals. To begin this internal referral investigation you should begin with an introductory meeting with key internal groups or divisions to explain what geriatric care management is. Many human service professionals do not understand geriatric care management. That internal meeting should cover what is GCM and why your staff should buy into adding this program to your mix, if it is feasible. Social workers and nurses many times see themselves are delivering care management services already and can be very threatened by adding for profit GCM to your non profit services. They may see you taking away what they give away for free and feel those free services are what their clients deserve. Then you need to demonstrate how each staff members will benefit by the addition of GCM. This is critical so your non-profit staff can see the advantage of incorporating GCM into your program and will make referrals. You are in effect priming the well of internal referrals after you do this you could begin to survey your staff to measure whether you have potential GCM clients in your present services that would pay for geriatric care management services.